How to Start Blogging: 7 questions people ask | The Decor Cafe | Interiors. Gardens. Lifestyle. Home business. 2. Why Blog for Business? Linked to social media, a blog will help you to build awareness of your business, connect to new customers and build a lasting relationship. Every time you update your blog with a new story and information you will attract more people to your website. Search engines love fresh website content and you will see your rankings rise, making it easier for new customers to find you. 3. How do you set up a blog? If you are technically competent you may choose to create your own blog from scratch but, for most of us over 30, it is easiest and most cost effective (if you consider the hours involved) to ask a web designer to create a blog for you to your own specification. They can then show you how to add your own content (words and images) which is actually really easy to do. 4. Which blog platform should you choose? 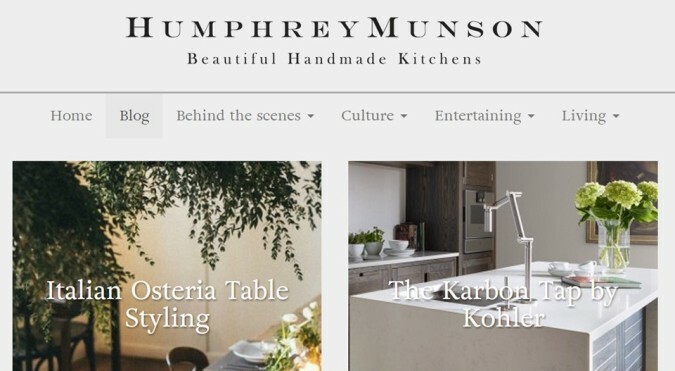 There are two types of blog – a blog which is integrated into your website, such humphreymunsen or a blog which stands alone, such as westegg. If you are setting up a blog to promote your business it is ideal to integrate it so that every time you blog your readers will be reminded about what you do. WordPress is a great platform for this. Square Space is a popular alternative to WordPress, with beautiful, easy to use templates but is much less flexible to customise. 5. What should you blog about? If you are blogging for business, every blog should be relevant to the business you are in. Always remember who you are writing for and what will be of interest to them. So, if you’re an interior designer your readers will be interested to discover all about the things that inspire you – wallpaper, furniture, paint companies, new product ranges, trade fairs. They will love the tips and ideas you share from your home and your projects. They may be interested to discover other details of your life but they probably don’t want to hear about your children, dog or hobbies every time you blog. Get started by writing a list of topics to blog about. Are you genuinely passionate about the topics? Do you read and research these topics regularly already? The problem with starting a blog focusing on topics you are not truly passionate about is that you’ll probably get bored and burn out after 2 months. Researching and writing topics that genuinely inspire are a pleasure to research and a joy to write – stick with these. Over time you will learn which topics create the most interest amongst your readers. Which they share, and which they don’t and this will help you to evolve what you write about. 7. What are the most imporatant Do’s and Don’ts? Do be yourself. Your personality is what makes you completely 100% unique. Allow it to shine through into your writing and let customers connect with you via your blog. Don’t be too formal and robotic. Write as if you were writing to an aunt, keep it polite but reasonably colloquial. Do create a content plan. Keep your topics narrowed down to 5-6 categories and start researching and making notes on posts you would like to write. This will help you avoid the blogging equivalent of “writers block”. Don’t copy others. If you really love a particular blog post series on another blogger’s website, think about what you love about it. Is it that you can rely on it to be published on a Monday? Is it that you see a snippet of a person’s real life? Build on their ideas to create your own unique content. Do write a description of the type of people you are writing for and keep it in mind. For example, if you provide tutoring for A’Level exams consider topics for both parents and teenagers such as recipe ideas for the night before an exam, how to relax after an exam, benefits of sleep. Don’t feel pressured into blogging because it’s been a week and you think I must blog! Quality is always better than quantity. Always. Do spell and grammar check. Don’t compromise on the quality of your images, they speak more than words. Do plan your blog post carefully so that it is well organised and easy to read.